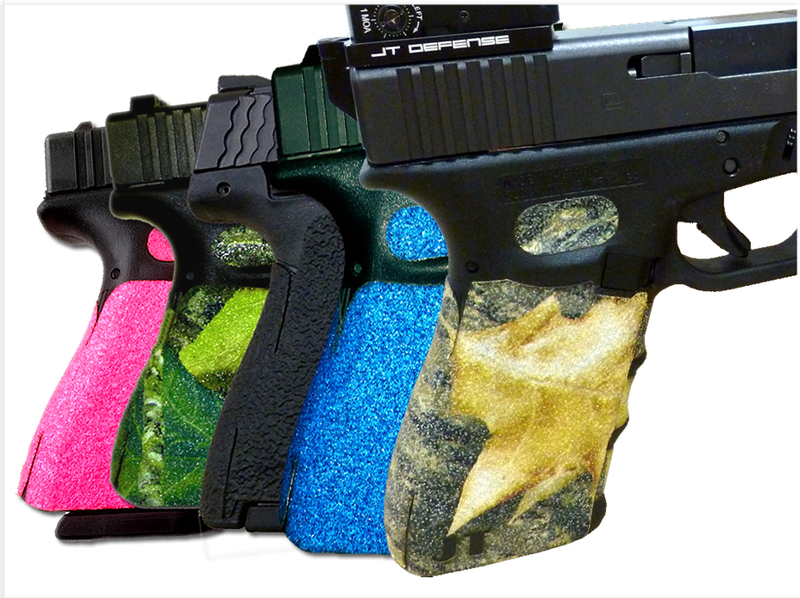 JT Defense, has developed the best, wrap-around adhesive grips for the Glock 20, in a variety of color and even camoflauge colors, to personalize your gun. The adhesive decal grips, wrap completely around the frame of the gun, and bond to every curve, leaving a seamless design. The design and contour of the grips fits so well, that many people who have never seen the pistol before, think that our grips were actually built into the gun, and are not an aftermarket grip tape added later. Some manufacturer's grips are designed with large sweeping turns or cuts, which allow for lifting, or peeling on the frame, and will come off over time, due to holstering, or just plain use. 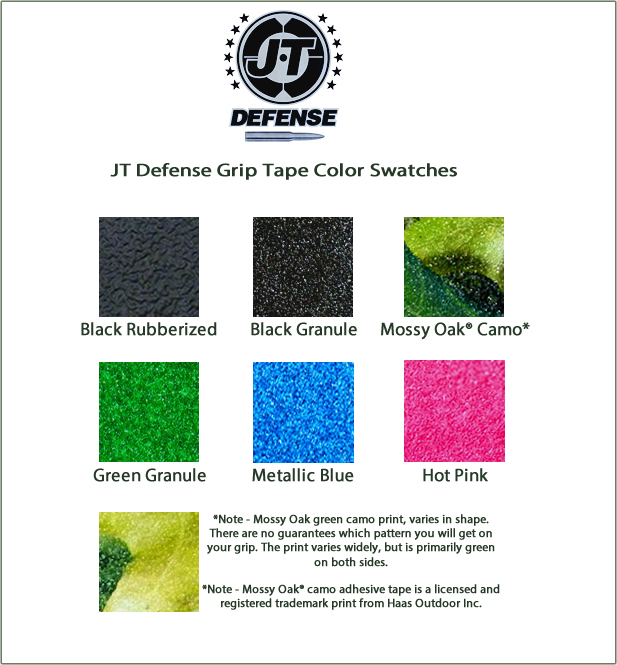 In fact, using other brand grips on the market is what led JT Defense to the development of a superior grip, which would not peel off after just a mere 2-3 months of use. The superior design of the Grips for Glock 20 and 21, allow for the seams to fit together, tight, keeping the grip tape from starting to peel at the corner. These grips are made from a custom tape, which is very similar to skateboard tape, but with a special blend of adhesives that sticks best to polymer and plastics. Does not come off easily unless you want to permanently remove them. With the Glock 20, adhesive grips are not just an option for the smooth Gen 3 frame, they are almost a mandatory shooting accessory. Feeling the adhesive grips wrapped around the Glock 20 frame, takes all focus off of the recoil and steady grip you have to maintain, but the grips actually allow you to concentrate on where you're putting the bullet, not on maintaining proper grip. The Glock 20 grips we manufacture, are laser cut, and have been highly revised over the last year, focusing on specific areas of the Glock 20 frame, changing contours of the gun, and focusing on putting specific grip material into certain areas that is best for that specific shooter. We are HUGE fans of the Glock 20 and believe it to be one of the best Glock models ever designed. We use this firearm every week, for target shooting, hunting, which we truly believe it is one of the best handguns ever developed for this, as well as fast shooting IDPA and USPSA pistol practice. In fact, the Glock 20, is the handgun we designed the Glock Red Dot optic mount for. This gun, is what sparked the creative idea behind this unique mount. Easy to install, it just takes minutes, plain tools, alcohol to clean the surface, and a heat gun, or, just setting the gun out into the sun, will activate the adhesive and bond it tight to the frame of the gun. Even though we call these "Decal" style, they aren't actually a decal. They are an adhesive grip, that bonds as one complete wrap-around design. If you ever want to change colors, or have worn your grips out over time, simply heating the adhesive with a heat gun or hair dryer, will re-activate the adhesive, and the grips will lift off, little if any residue on the polymer frame. The Glock 20 grips, are custom designed specifically for areas of your hand, to give adhesion in certain areas of your hands, which are in contact with the gun. We've taken into consideration, right and left hand shooters, for equal ambidexterous coverage on both sides of your hands. For the specific product page on the Glock 21, please follow the link. The grips are virtually identical, but helps with people searching and finding the correct page. Stop focusing on your grip, and focus more on your target with the JT Defense Adhesive Decal grips for the Glock 20 and Glock 21 model handguns. Green - Slightly too green for our taste, but they do look excellent on some guns.